The 2015 annual conference of Wuhu Hengxin automotive interior Manufacturing Co. Ltd. In March, just scenery. On March 27, 2016, all Hengxin people gathered in Bantang Holiday Hotel, hobnobbing, neither live up to this thick the awaken of spring, and broaden the hard busy a year the employee perspective, happily spent the year 2015 conference, and take advantage of Hing Tashangguitu, more wonderful 2016 struggling to fight! In March 27th 9:30, Hefei Wuhu Hengxin people gathered in front of the hotel. Both wear suit handsome guy or dressed girls and aunt in the soft style all conceal inner joy, natural lawn outside the banquet hall, happily talk, greet the arrival of the annual meeting. Banquet hall, clean the carpet comfortable and pleasant, conference table neatly covered with red cloth, wall screen playing inspirational movie. Everywhere in the show a faction beaming picture, share with us the joy and wonderful. At 10:00, chairman Zhao lead, Li Jianguo, general manager, financial director Jiang Zhongsheng, technical director Chao Qun Zhou and senior adviser to Wangsu, invited guests Caixia line leading rostrum sat, annual awards ceremony officially began. 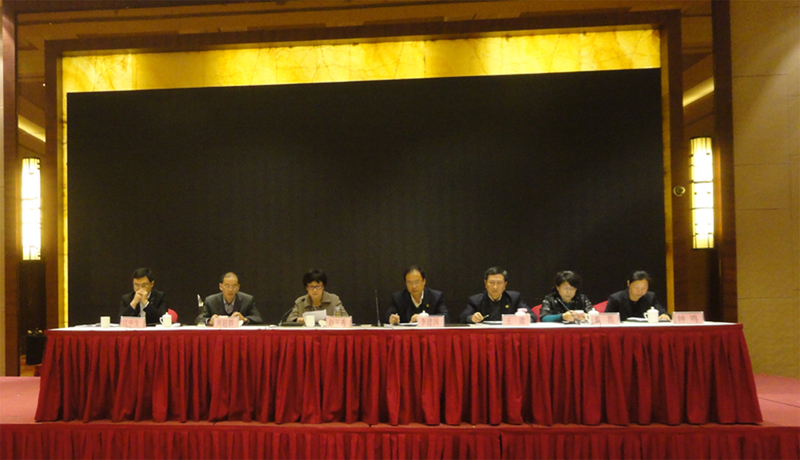 Zhong Ming, assistant general manager, presided over the meeting. Leadership speech and presentation activities interspersed. Li Jianguo, general manager of the speech carefully and comprehensively reviews the efforts made by 2015 departments, from development to sales, from procurement to warranty, from the general to the finance and even the work of the Party branch of company are nuanced include. Li's general report not only summarizes the past, but also points out the way forward for this year's work. Summary 2015, outlook 2016, let all people Hanson more clearly their own goals and direction, won warm applause. , Zhao chairman in his speech review 2015 situation, Hanson in the context of the global economic downturn and on the contrarian, the realization of the double output value and profit growth. And analysis of the current economic situation, talk about Hengxin development ideas, depicting a bright future prospects, Hanson will make the lightweighting of Chinese automobile industry benchmarking enterprises! This speech, to win the applause of everyone! Chairman Zhao speech, let us understand: the road ahead although there are ups and downs, but as long as all Hanson, unity and hard work, pioneering and innovative, the target will be achieved. Hengxin people will be more passionate spirit and more down-to-earth style of work, to achieve the goal! Ride the wind and waves, dreams! The ceremony was interspersed with, let the staff smile. Gazing at these lovely Hengxin people, we are encouraged to feel whole body have the strength, the gas station, let us gather strength, to 2015 has been affirmed and recognized the company, 2016, Hengxin people will be poised to take off, under the leadership of chairman, forward on the road towards the pace will be more solid and strong. At noon 12:30, the official start of the banquet, chaired by the general secretary Wei Jun. The performance, at the same time draw. We taste the delicious food, while enjoying the performances brought by the various departments. Table portrait show, audience applause, mingled with the sound of the whistle sound continuously, on the stage under the interaction of a piece, the atmosphere of the scene again and again to a climax. The gap in the show, the exciting unceasingly the raffle and began, the company is thank leaders and employees of hard to pay to prepare for a very rich prizes, full of surprises raffle, let us excited again and again! Banquet, Gongchoujiaocuo, atmosphere, greeting heard; and Taiwan, moderator quips, layer after layer of climax, let Hanson in song and laughter in the feeling of Hanson's harmonious! Finally, in a piece of laughter over our annual dinner. At 2:30 in the afternoon, we rushed to highland tulip parking field, attend to the journey tired, and down the mountain, walk to the garden base, whether it is halfway and return, or hard to reach the destination to enjoy the flowers, enjoy the different scenery. Because we know: the important thing is not the scenery, but the scenery of the people and the mood. Such a good day, the mood is not to mention! Although the end of the year, but the pace will not stop Hanson Hanson, inspiring the spirit of hard work will not stop. In 2015, we have a year of hard work and pride, rushed out of their own style; 2016, we must open a new hope, carrying more ambitious dream, on a road trip with the proud, continues to blaze the trail, create brilliant!